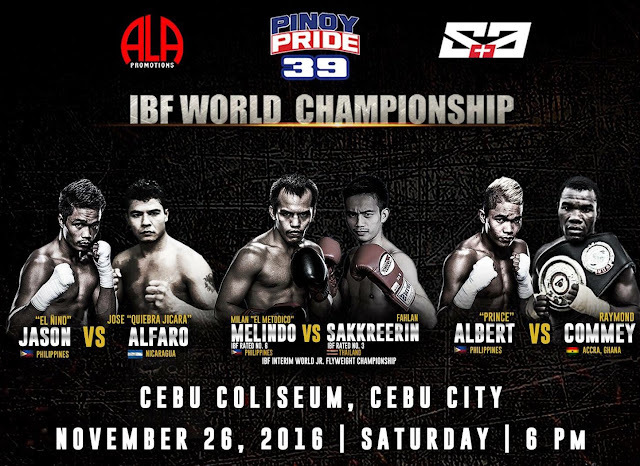 Check out the complete fight card of Pinoy Pride 39: Road to Redemption featuring Milan "El Metido" Melindo vs the Thailander Teeraphong Utaida for the interim IBF World light flyweight title. Fight will be held at Cebu Coliseum, Cebu City, Cebu, Philippines on November 26, 2016. This event is brought to you by ALA promotions with cooperation of ABS-CBN Sports and Action.